Portland Cement, imported direct from the best English makers. Send for circular. J. E. Mitchell, 310 York Ave., Philadelphia. The Watch—Its history, construction, how to choose and how to use it. Illustrated. This useful work, neatly bound, price, postpaid, 60c. Address the author, H. F. Piaget, Watch Kepairer, 119 Fulton st.,N.Y. Photographic Printing. 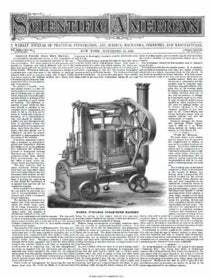 The patent on the apparatus of Jean Elie Richard, illustrated in last Scientific American, will be sold or licensed, in part or whole, on very reasonable terms. Address inventor. Sweeny's Hotel, New York. Terra Cotta Statuary.—Manufacturers of Terra Cotta Statuary and vases, for ornamenting country places, are requested to send catalogues of their manufactures to the editor of this paper. Fire Damp in Mines.—Parties who wish to join the Inventor of a Preventive for Fire Damp, in obtaining Patents in France, Belgium, England, and America, may address Robert Blacklidge, Bridgeport, Conn, Grindstone shafts, with self-adjusting plates, will prevent Stones bursting. Made a specialty by J. E. Mitchell, S10 ork ave.,Phil'a. Valuable Patent (combined Table and Cradle) for sale. Can be manufactured as a Toy,or an article ef use. Will sell rapidly as either. Philadelphia Patent and Novelty Co., 717 Spring Garden st. For Aluminum Bronze and Oroide Watches, Chains,and Jewelry, send to Oroide Watch Co., Boston, IL S. Price list sent free. For Sale—A patent for a composition for covering steam boilers, pipes, etc. E. D. W. A. French, 3d and Vine sts., amden, ?. J. For tinmans' tools, presses, etc., apply to Mays Bliss, Brooklyn, N. Y. Mill-stone dressing diamond machine, simple, effective, durable. Also, Glazier's diamonds. John Dickinson, 64 Nassau st., New York. For Sale—60-H. P. Engine and two large Tubular Boilers,first rate order. Will be sold cheap. N. D. Preston, Fulton, Oswego Co., ?. Y. Peck's patent drop press. For circulars, address the sole manufacturers, Milo Peck Co., New Haven, Ct. Send for a circular on the uses of Soluble Glass, or Silicates of Soda and Potash. Manufactured by L. J. W. Fcuchtwanger, Chemists and Drug Importers, 55 Cedar st., New York. Manganese Ores suitable for glass, steel, oil boilers, at low prices. Muriatic Acid, lull strength, price \)4 cents per lb. Soda Ash. Bleaching Powder, fresh made, full test, p.t market prices. Michigan Chemical Company, Jackson, Mich. Shafting, Hangers, and Pulleys, Craig's Oscillating Steam Engines, on hand and to order. Gallatin Brevoort Machine Works, 223 Front st., New York. Glynn's Anti-Incrustator for Steam Boiler—The only reliable preventative. No f oaming,and does not attack metals of boiler. Liberal | terme to Agents. C. D. Fredricks, 587 Broadway, New York. , Chemicals, Drugs, Minerals, Metals, Acids,etc, for all Mechan- : ics and Manufacturers, for sale by L. J. W. Feuchtwanger, Chemists, and Importers of Drugs and Minerals, 55 Cedar st., New York. Cold Rolled—Shafting,piston rods,pump rods,Collins pat.double compression couplings,manuf actured by Jones Laughlins,Pittsburgh,Pa. For solid wrought-iron beams, etc., see advertisement. Address Union Iron MillG, Pittsburgh, Pa., for lithograph, etc. Machinists, boiler makers, tinners, and workers of sheet metals read advertisement of the Parker Power Presses. Diamond carbon, formed into wedge or other shapes for pointing and edging tools or cutters for drilling and working stone, etc. Send stamp for circulai* John Dickinson, 61 Nassau st.. New York. ? Winans' boiler powder, 11 Wall st., ?. Y., removes Incrustations without injury or foaming; 12 years in use. Beware of Imitations.